Ten years away from the global financial crisis and in the aftermath of the 1MDB scandal, consumer confidence in Malaysia’s financial sector is strong, with 83% of Malaysians saying the sector has a good reputation. In the inaugural Financial Services Reputation Index for Malaysia,by MHP Communications, it is also revealed that 83% of consumers believe financial services companies have become more trustworthy in the past decade. High levels of positivity were also seen across Asia, with 90% of respondents in Singapore and India rating the industry’s reputation as good, as well as 82% and 84% in China and Hong Kong respectively. These findings are in marked contrast to sentiment in the United Kingdom, where only 53% of respondents polled were positive. 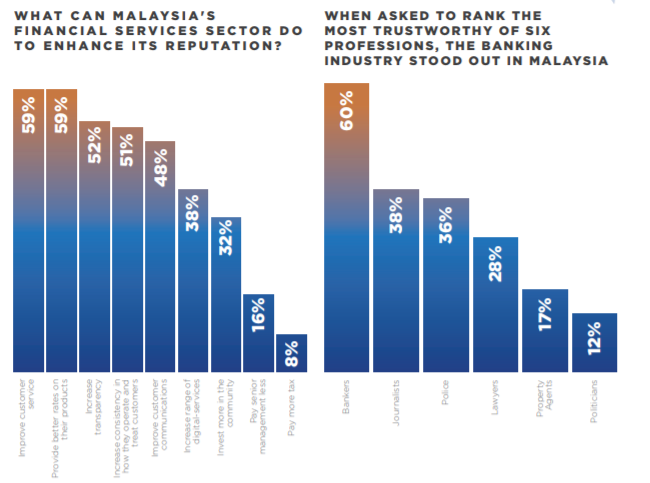 Malaysians also ranked bankers as the most trustworthy profession in the country (60%), followed by journalists (38%) and the police (36%). They do not share this sentiment for politicians/government officials, who were the least trusted among the professions asked (12%), potentially due to a lack of public confidence in previous administrations and also from the reputational fallout of various Government-linked financial scandals. The top five most trusted financial services brands are all Malaysian banks—Maybank, CIMB, Public Bank, RHB Bank and Hong Leong Bank, representing greater consumer trust in local brands. 68% of respondents believe that local banks have a better reputation than their foreign counterparts.